AirBridgeCargo Airlines (ABC), one of the world’s leading international cargo carriers, has showcased its expertise in the transportation of oversized and super-heavy cargoes with the delivery of 22-metre pipes for a solar energy project onboard one of its Boeing 747 freighters for European customer, Neele-Vat Air B.V. 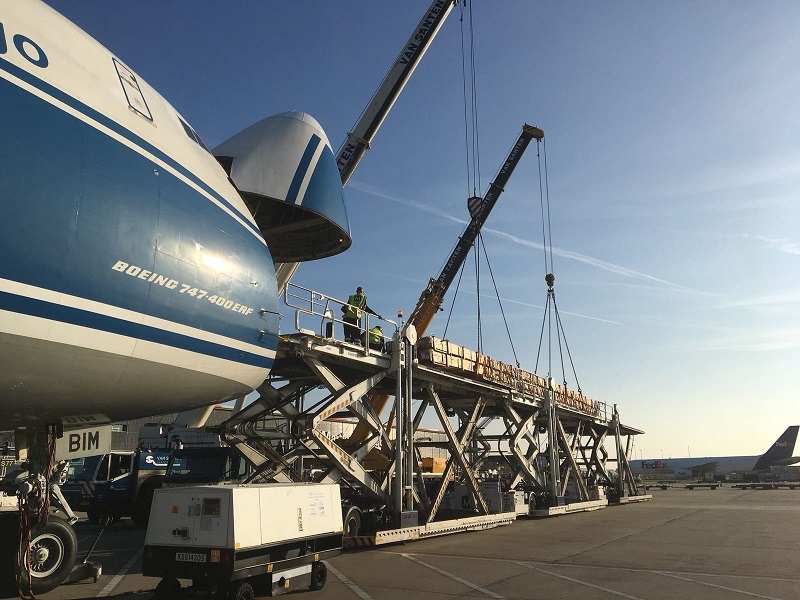 Eight crates weighing around 20,000 kg and measuring 2200x50x50cm were loaded through the 747’s nose-swing door in Amsterdam, with the help of two loading cranes, in preparation for the delivery to Zhengzhou, China. AirBridgeCargo’s team of logistics practitioners and operations specialists, together with the airline’s ground handling partners, are experts in the transportation of off-size cargoes and are regularly called upon by customers to provide safe, seamless and reliable deliveries embracing all the stages of the transportation process, including loading, lashing, and unloading. “With only a few cargo carriers in the world able to provide a nose-door loading option for very long and out-of-gauge shipments, we are proud to have been chosen for this project, which acknowledges our proven expertise in performing technically challenging and complex deliveries. Our abcXL service is the result of strong internal support and the alignment of the company’s procedures, the reinforcement of our commercial and operational teams, and the management of our service quality with the launch of our 24/7 Control Tower. All of these efforts reflect our commitment to continually improving our product offering to meet the needs of our global customers,” stated Sergey Lazarev, General Director of AirBridgeCargo Airlines. In the first three months of 2018, AirBridgeCargo experienced an 18% year-on-year increase in the number of oversized cargoes being loaded through the nose door of its 747 freighter aircraft using special handling procedures. The unique capabilities of ABC’s freighter fleet and its nose-loading capabilities make it possible for the airline to deliver such complex consignments as gas turbines, industrial equipment, oil&gas equipment, aerospace cargoes such as parts, fuselage, engines, and helicopters, as well as tractors, mining equipment and other products which require special care and attention.